Members of the Pyroteuthidae are small (23-50 mm ML), muscular squids that occur in mesopelagic depths during the day and migrate into near-surface waters (0-200m) at night. They are among the more common squids found in the midwaters of the open ocean. They are most easily recognized by the sharply pointed "tail" and fins that are separate, each with a nearly circular outline. They also have large buccal membranes with unusual attachments to the four dorsal arms and peculiar tentacle bases. The latter, which have a permanent bend, presumably, increase the degree of the retraction (i.e., shortening) of the tentacles. Each fin nearly circular with anterior and posterior lobes. Photophores present on viscera, eyeballs and tentacles but absent from mantle, funnel, head and arms. Hooks present on (at least) arm pairs I-III in 1 or 2 rows. Armature of clubs quadraserial with hooks present or absent.. Permanent constriction and bend near tentacle base. Tentacle-stalk "ligament" and vein leave stalk distal to base of tentacle and not in membrane. The typical large, bent tentacle base with the slender retractor muscle is seen here in two photos of Pyroteuthis addolux. Secondary connectives attached to ventral margin of arms I and II. Figure. The peculiar fusion of the buccal membrane to the dorsal arms in pyroteuthids is seen in this partial oral view of Pyroteuthis addolux. Photophores present on viscera, eyeballs and tentacles (absent from mantle, funnel, head surface and arms). Gladius with small strongly pointed conus. Tail without fleshy extension beyond gladius (see previous figure and title figure). Figure. The pointed conus of the gladius is visible in this photo. The posterior abdominal photophore is nestled in the conus. The blurred region to the right (anterior) of the posterior abdominal photophore is the edge of the broken skin. Note the two mid-abdominal photophores farther anterior in the midline. Subterminal with free anterior and posterior lobes (see title photograph). May be reduced or absent on one side (unique in the Oegopsida) (see photograph of visceral photophores below). The presence of a lidded ocular photophore only in Pterygioteuthis. Figure. 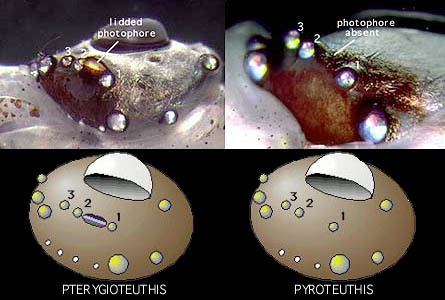 The arrangement of ocular photophores differs between Pterygioteuthis (left) and Pyroteuthis (right) in that the latter lacks the large lidded photophore and has fewer minute photophores. Note the irridescence from iridophores within the large, non-lidded photophores. Differences in the structure and arrangement of tentacular photophores. Differences in the size and arrangement of visceral photophores. The visceral photophores of the two genera are similar in arrangement but the branchial photophores are much larger in Pterygioteuthis (left illustration), and the anterior abdominal photophores in Pyroteuthis (middle illustration) consist of three photophores rather than one. Figure. Left - Immature Pterygioteuthis microlampas. Middle - Mature female Pyroteuthis addolux. Right - Labeled diagram drawn from the Pyroteuthis photograph. Note the difference in the sizes of the oviducal glands suggesting that only the right oviduct is functional. The most posterior abdominal photophore of Pterygioteuthis and the two most posterior abdominal photophores of Pyroteuthis are not within the bounds of these photos. The presence of tentacular hooks only in Pyroteuthis. The greater number of arm hooks in Pyroteuthis. The presence of a tooth plate in the hectocotylus only in Pterygioteuthis. A list of all nominal genera and species in the Pyroteuthidae can be found here. The list includes the current status and type species of all genera, and the current status, type repository and type locality of all species and all pertinent references. Where known, pyroteuthids feed on copepods and other small crustacea. The maximum age estimated for Pterygioteuthis gemmata is 78 days (30 mm ML, female) based on statolith increments and sexual maturity was reached at 60-65 days (Arkhipkin, 1997). Presumably other members of the family are also short lived. Mating and spawning have never been observed in members of this family. All members, however, have a specialized pouch located dorsal to the digestive gland and opening between the stellate ganglia. Spermatangia (discharged spermatophores) are commonly found attached to the opening of this pouch. Photograph of female Pterygioteuthis microlampas, dorsolateral view, off Hawaii. Photograph by R. Young. Paralarvae are recognized by the unique bend in the tentacle base and the small clubs and by the unique ocular photophores in large paralarvae. The paralarva in the photomicrograph is about 2 or 2.5 mm ML. Photomicrograph of paralarval P. microlampas, side view, off Hawaii. Photograph by R. Young. All pyroteuthids have large ocular and abdominal photophores. In Pterygioteuthis spp. these photophores have been demonstrated to function in obliterating the squid's silhouette under dim downwelling light (Young, et al., 1980). Presumably all pyroteuthids, along with many other midwater animals, conceal themselves by this method (counterillumination) in dimly lit midwaters during the day. Pterygioteuthis sp. has a peculiar second set of giant nerve fibers that run from the sides of the brain (lateral wall of the magnocellular lobe) into the arms via contact with second order giant fibers in each arm. This innervation suggest that Pterygioteuthis can make fast movements with its arms (J. Z. Young, 1977). We do not know why it should need such fast arm movements. Presumably other members of the family also have this peculiar modification of the nervous system. The modifications of the nervous system, the large buccal membrane with its unusual attachments to the arms and peculiar tentacle bases suggest that these squids exhibit unusual behavior that has yet to be observed. Members of the family are upper mesopelagic vertical migrators that are found throughout most of the tropical and temperate regions of the world's oceans. However, they appear to be absent from Japanese waters. This map shows the general localities (white circles) where pyroteuthids have been captured. Only one record per general locality is included. Arkhipkin, A. I. 1997. Age of the micronektonic squid Pterygioteuthis gemmata (Cephalopoda; Pyroteuthidae) from the central-east Atlantic based on statolith growth increments. J. Moll. Stud., 63: 287-290. Young, J. Z. 1977. Brain, Behaviour and Evolution of Cephalopods. Symp. Zool. Soc., London, 38: 377-434. Young, R. E. and R. F. Harman. Phylogeny of the "enoploteuthid" families. Smithson. Contr. to Zool. No. 568 (I): 257-270. Young, R. E., E. M. Kampa, S. D. Maynard, F. M. Mencher and C. F. E. Roper. 1980. Counterillumination and the upper depth limits of midwater animals. Deep-Sea Res. 27: 671-691. Young, R. E., L. A. Burgess, C. F. E. Roper, M. J. Sweeney and S. J. Stephen. Families Enoploteuthidae, Pyroteuthidae and Ancistrocheiridae. Smithson. Contr. Zool. No. 586(I):239-256.